If you were expecting to see bloody photos of rival fraternities battling each other, then I’m sorry to disappoint you. The Frat War I’m writing on here is that of the Upsilon Sigma Phi’s war on poverty. Now before I start hearing in the background comments like “Trapo! Just like GMA who keeps on declaring a War on Poverty,” read on about what happened – because on this hot and steamy labor day, the brods chose to use shovels, barettas, and pick axes to move dirt and stones for tangible and realistic results – the construction of communities. Yesterday, 1 May 2005 – while our colleagues in the universal fight against poverty and oppression were clamoring on the streets for better labor conditions, Upsilonians decided to work on something else other than funding reportedly expensive student election campaigns and the like. We chose to partner with Gawad Kalinga (GK), a multi-sectoral partnership that counts among its varied donor-volunteers individual Philanthropists, Churches of different faiths, capitalist Corporations, Schools, Government Agencies, and community-based People’s Organizations. GK envisions a Philippines with “NO MORE SLUMS”. Based on the rationale that environment has a big role in changing people’s behavior for the better, the partnership initiated by the Couples for Christ Catholic organization aims to build for the Filipino people 700,000 homes in 7,000 communities in 7 years. To date, 8,000 homes have been built as of October 2004 in 330 sites nationwide. Each dwelling is approximately 20-25 sqm, with its own toilet and kitchen. Built through what is known as sweat-equity (bayanihan to us Filipinos), the would-be beneficiaries and socio-civic volunteers come together to dig, hammer, and paint the construction site, at a cost of not more than PHP 50,000 per home. The communities are designed to have small town centers with schools and churches, with houses being brightly colored and pathways having landscaped gardens. What I find most important of all is a guiding principle of GK – that dole outs will make us a country of beggars, and that the program’s goal is to teach self-reliance through productivity. Over a span of 3-5 years, the responsibility of managing the community is completely transferred to what they call a “Kapitbahayan” or homeowner’s association run solely by the residents themselves. This Kapitbahayan sets standards for cleanliness, peace and order, conflict resolution, and community mobilization, among other things. 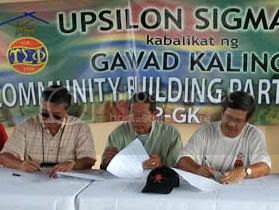 What makes the event yesterday special is that the Upsilon Sigma Phi is the first fraternity in the whole country to ever venture into a partnership with the likes of GK. Chairman Claudio B. Altura and President Danilo A. Gozo. For some time now, the image of Greek-Lettered Organizations (GLOs) – fraternities and sororities – has been degraded by violence and the much-feared hazing/initiations. It has been alleged that GLOs are no longer relevant to today’s society, having reportedly outgrown its significance. In the mid-20th century frats and soros had their heyday – a lot of leaders and society movers then were actually fratmen and sorority sisters. The Upsilon, being the acknowledged oldest fraternity not only in the Philippines but in the whole of Asia, is no exception to this stigma of fraternities being reduced to the likes of street gangs. That is why the fraternity leadership decided not only to pay lip service to commitments to change the direction of GLOs (concepts like those forged by anti-violence advocate Raymund Narag), but to act on the call of Narag et al. to pursue genuine brotherhood through peaceful means. Thus avoiding violent rumble as it always does, the Upsilon has ventured into digging rubble. And if someone out there decides to call us a fraternity of manual laborers, we would not mind – because the pain this time is not due to what other fraternities may be inflicting by paddling, but be by virtue of toil towards the eradication of poverty in this nation, one step at a time. Yesterday was a historical moment, for the fraternity system is now visibly changing to get rid of the negative aspects of brotherhood. Perhaps time will come again when being called a “fratman” will not label a brother with the shame of violence and hatred, but with the honor and prestige of being committed to pursue economic stability and political maturity, perhaps not only in the Republic of the Philippines but also in the rest of the world. of the Philippine Collegian, also got his hands dirty. The only “hits” we Upsilonians got to do were on roaches disturbed from their hideouts in the soil as we went on to craft drainage trenches for two houses at the Gawad-Kalinga Brookside area in Quezon City.